Puck Pentenga points during a game. Pentenga is the lone returning All-American for NU. In college football, teams generally open their seasons with weaker competition. This year, in their first games, No. 2 Clemson plays Furman, No. 3 Georgia plays Austin Peay, No. 4 Wisconsin plays Western Kentucky and No. 5 Ohio State plays Oregon State. 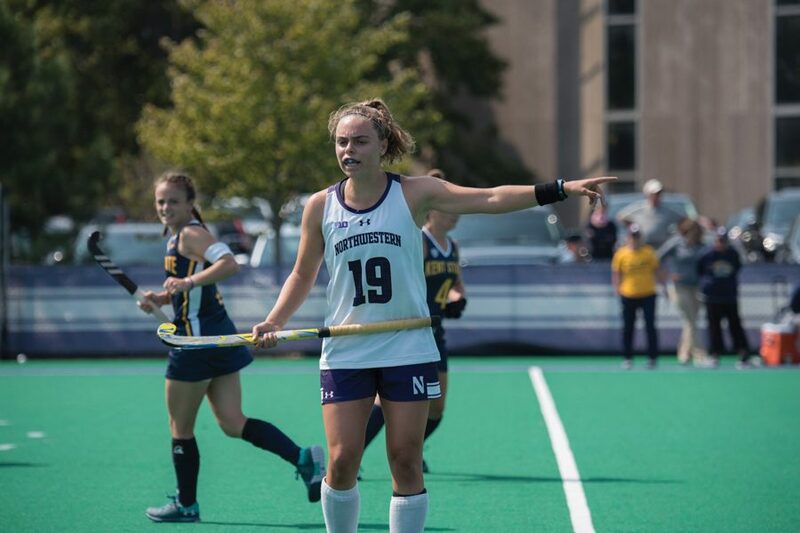 In field hockey, Northwestern has taken the exact opposite route. The Wildcats open their season Friday hosting the defending national champions, No. 1 Connecticut. They’ll also take on No. 15 Stanford at Lakeside Field on Sunday. This is not an example of the Huskies beating up on lesser competition. Last year, NU was a national quarterfinalist and had two All-Americans. The Cats open the season at No. 12 in the country. Senior midfielder Puck Pentenga is the lone returning All-American for NU. Pentenga led the team in assists last season and finished fourth in the nation in assists per game. She is a do-everything midfielder for the Cats and the engine driving their offense. There are, however, still questions for NU up front. Last year’s leading scorer, Pascale Massey graduated in the spring, so the forward duo of junior Saar de Breij and sophomore Lakin Barry will likely be left to fill Massey’s role. Berry and de Breij combined for seven goals last season. The Cats also took on Stanford and UConn to open play last season. After beating the Cardinal 1-0, they were blown out 7-0 by the Huskies. It was their worst loss of the season by far, as NU managed only three shots on goal to UConn’s 17. UConn was the best team in the country last season, and the Huskies have won three of the last five national championships. In 2017, they scored more goals than any other team and also had the lowest goals against average in the country. Superstar forward Charlotte Veitner, who had 34 goals last year (nine more than anyone else in the nation) has graduated, but the Huskies won’t be any less intimidating when they roll into Evanston on Friday. Last year, NU’s defense wasn’t up to the task, and that was with First Team All-American and unanimous All-Big Ten defender Sophia Miller. With Miller having graduated, it will be up to junior goalkeeper Annie Kalfas, who made eight saves in the first half against UConn last year, and junior defender Kirsten Mansfield to lead the defense in an effort to prevent a repeat of last year’s result. There are still unanswered questions for the Cats, having lost their best defender and leading scorer. By opening the season against the defending champions, they’ll know quickly if they have the answers. Correction: A previous version of this story misspelled the name of Lakin Barry. The Daily regrets the error.